The laid back surf punk sound of The Growlers is seeing a renewed uptick in attention as the band takes a victory lap for the album they released last September. They will be touring for another two months, playing in 14 different venues from Los Angeles to Brooklyn in about 30 days. So while Chinese Fountain may sound like a holdout from last year, their self-described beach goth vibe makes for an excellent way to ease into a new one. The reverb heavy post-punk anglings meander through 11 tracks of throwback gypsy folk and spaced out psychedelia. So while the overtly consistent pacing can grow wearisome as an album, The Growlers hit half a dozen standalone tracks that sound near perfect amidst a more diversified playlist. Collectively, the album is at once a triumph in producing some of the band's strongest material in years and a disappointment in being one of least varied outings since the band came together eight years ago. Where The Growlers make a splash on Chinese Fountain. Evidence of a great album starts with the increasingly familiar track Good Advice. The track smacks of everything that makes the album alluring, including the downbeat lyrical licks at life — "There's nothing as depressing as good advice," sings vocalist Brooks Nielsen. Good advice is arguably the best track on an album that was demoed out in Topanga after two weeks, assembled at their manager's Claremont home in one week, and then recorded in less than two weeks at Sea Horse Sound Studio in Los Angeles. Nielsen said it works best that way, with him and guitarist Matt Taylor responsible for most of the writing on all of the tracks. Chinese Fountain is the second try to record a proper studio album. The last one, attempted in 2012, was scrapped. The new one works, even if it is missing the charm of being produced on the fly. That's not to say that the band wasn't rushed to get the job done. Manager JP Plunier jumped in to produce it when the band became hung up on their attempt to channel reggae hitting the English punk scene in the 1970s. The title track, Chinese Fountain, comes closest to capturing that concept thread before breaking into a punk funk. The opener, Big Toe, is more indicative of what to expect from the album. The jangle they used to be known for is understated. The relaxed surf punk vibe is always punctuated by Nielsen's pleasingly rustic and swooning twang. Other standouts include the remorseful Dull Boy, the dusty ballad Going Gets Tough, and the sarcastic doo wop ode to love in their home own. Purgatory Drive seems to stall instrumentally as a composition, but the lyrical sharpness more than makes up for it. The track touches on someone stuck in the drive between their mediocre job and broken home. Expect shivers if you think about it. "This is my chance to let it all out," Nielsen says of these songs. "I kind of bottle things up and don’t really get emotional. But I think if I don’t open up, I’d be a really stale person." 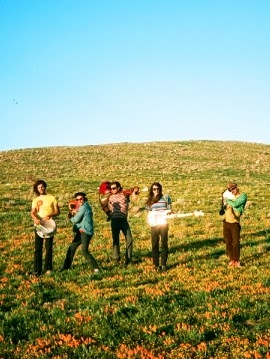 Chinese Fountain By The Growlers Takes Out 6.9 On The Liquid Hip Richter Scale. Overall, the album features brilliant songwriting by Nielson and Taylor, and tighter playing by them and the balance of the band that includes Scott Montoya, Kyle Straka, and Anthony Perry. Even the best tracks seems to overshadow too much whimper and not enough growl as an album. See them live if you can. It's well worth it. Chinese Fountain by The Growlers can be discovered on Amazon. You can also download the album from iTunes. You can find Chinese Fountain and more from The Growlers at Barnes & Noble too. For show listings, visit the band on Facebook. They play 150 shows a year on average.